We have a large variety of Womens Accessories, (jewelry, scarves, handbags, gloves, hats..). We can ship anything anywhere in the U.S. Call today if you see something you like. Our inventory is changing every day, so if you don't see exactly what you are looking for, give us a call at 608-588-9999 and we can see if we can assist you! 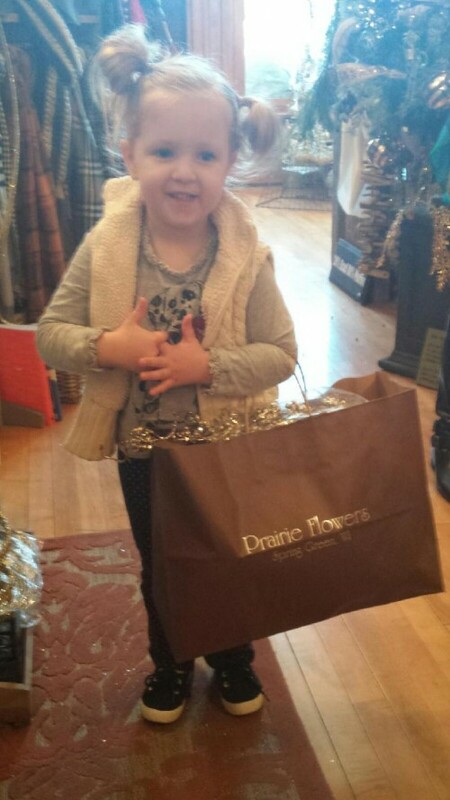 Here's my little granddaughter... she found a few things she likes! 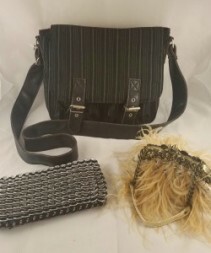 ASSORTED WOMENS HANDBAGS ____________________________________________________________________________ BLACK AND SILVER SODA CAN TOP CLUTCH BAG - recycled. Proceeds from the production of this bag go to the Lazos de Esperanza foundation, women and single mothers living in difficult conditions are empowered and earn a fair wage through the production of these bags. Brings hope to their communities and allows them to provide 4 their families. Recycled soda can tops. Measures 4 in. x 7.5 in. $36.95. ____________________________________________________________________________ I PAD SATCHEL BAG - Metro Menswear Stripe Bag with leather strap. Measures 9 in. x 11 in. $58.00. ____________________________________________________________________________ FEATHER AND LACE BAG - Camel color as shown, with chain and leather strap. Measures 5 in. x 6.50 in. $59.95. 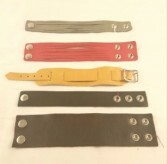 ASSORTED WOMENS LEATHER STRAP BRACELETS AND WATCHBANDS _____________________________________________________________________________ TOP TO BOTTOM -1 1/4" WIDE STRAP BAND LEATHER BRACELET - Shown in Silver. $20.00. _____________________________________________________________________________ 1 3/4" WIDE STRAP BAND LEATHER BRACELET - Shown in Red. $22.00. _____________________________________________________________________________ 1 1/2" WIDE SINGLE STRAP LEATHER BRACELET OR WATCHBAND - Shown in Gold. $18.00. _____________________________________________________________________________ 1.2" WIDE LEATHER BRACELET - Shown in Black. $18.00. _____________________________________________________________________________ 2" WIDE LEATHER BRACELET- Shown in Brown. $22.00. ASSORTED MENS LEATHER BRACELETS AND WATCHBANDS _____________________________________________________________________________ TOP TO BOTTOM - TRIPLE STRAP MENS LEATHER BRACELET OR WATCHBAND - 4 1/4" wide. Shown in Dark Brown. Adjustable. $89.00. _____________________________________________________________________________ DOUBLE STRAP MENS LEATHER BRACELET OR WATCHBAND - 2 3/4" wide. Shown in Black. Adjustable. $49.00. _____________________________________________________________________________ 3" MENS LEATHER BRACELET - hidden inside zip compartment to hold $. Shown in Brown. Adjustable. $29.00. 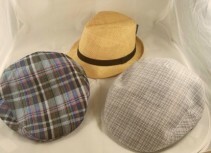 MENS ASSORTED HATS AND CAPS - many adjustable, and some are sized. Give us a call today to see what is in stock. Prices start at $26.95. NOELLE CONVENIENCE CROSSBODY W/MAGNET CLIP - Perfect size for a phone, lipstick and some cash. 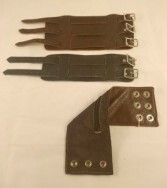 Use the attached over the shoulder strap or unattached it to connect through a belt. A variety of colors are available. Measures approximately 4" x 7". $29.95. _____________________________________________________________________________ NOELLE CLASSIC CROSSBODY W/TOUCH OF CHAIN - Multiple compartments for all your necessities. Over the shoulder leather and gold chain strap. A variety of colors are available. Measures approximately 6" x 8.5" x 2" deep. $39.95. _____________________________________________________________________________ NOELLE STRUCTURED HANDBAG - Multiple compartments for all your gear. Straps and detachable over the shoulder strap as well. A variety of colors are available. Measures approximately 13" x 11" x 6" deep. $69.95. 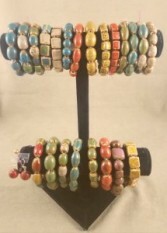 ASSORTED CLAY BRACELETS - Select a color, or let us select one for you. 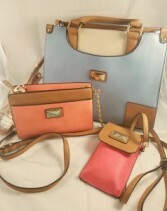 Choose from Multi Color or Solid Color. Elastic band, so one size fits all, Wear 2 or 3 together for a great look. $6.00. _____________________________________________________________________________ ASSORTED CLAY EARRINGS - Select a color, or let us select one for you. $9.00. PEARL EARRINGS - Several styles on hand - call today to see what is in stock. Starting at 9.95. _____________________________________________________________________________ PEARL BRACELET - Several styles on hand. This one is $14.95. 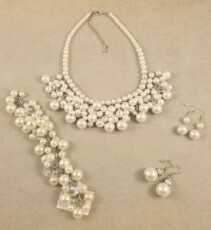 _____________________________________________________________________________ PEARL NECKLACE 0- Several styles on hand. 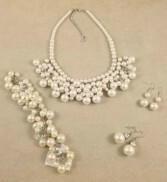 This one is $31.95, but we also have cultured pearls at varying prices. 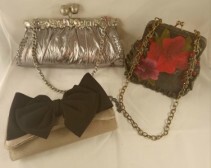 ASSORTED PURSES - Call us today to see what our selection is. Many styles to make any purse lover happy. _____________________________________________________________________________ TAUPE CLUTCH WITH BLACK BOW - Perfect for any dressy occasion. Has detachable chain strap. $49.95. _____________________________________________________________________________ LAVENDER/SILVER WITH RHINESTONES - 2 zip compartments. Measures 5" x 11.5". $62.00. _____________________________________________________________________________ VINTAGE LEATHER WITH RUFFLE AND WOOL FELT FLOWERS - Decorative chain. Measures 6" x 7". $133.00. We have lots of Pins and Brooches. Call us today to see what is in stock today. Some are antiques, some are vintage, and some are new. Here is just a sampling. _____________________________________________________________________________ VINTAGE CRYSTAL BROOCHE - $15.95. _____________________________________________________________________________ VINTAGE BUTTERFLY HAIR CLIP - Black stones and crystals. $18.95. _____________________________________________________________________________ ANTIQUE TOPAZ AND CITRINE BROOCHE AND MATCHING EARRINGS SET - $85.00. _____________________________________________________________________________ ANTIQUE WEISS BUTTERFLY PIN - $95.00. 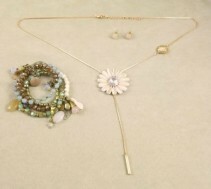 ASSORTED JEWELRY - We have a nice assortment of jewelry in the shop. Call us today to see what we have that you might like! _____________________________________________________________________________ ASSORTED RINGS - elastic rings fits all. Choose all silver, silver/black or silver/gold/copper/black. $18.95 and $24.95. _____________________________________________________________________________ SEMI-PRECIOUS STONES OF AQUAMARINE, AMETHYST AND OLIVE SET IN A BRASS BRACELET - $34.95. _____________________________________________________________________________ SEMI-PRECIOUS STONES OF AQUAMARINE, AMETHYST AND OLIVE SET IN A BRASS NECKLACE - $39.95. 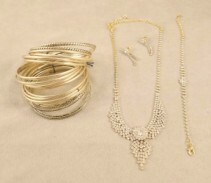 ASSORTED JEWELRY - give us a call today to see what we have in stock that will go perfectly with what you are looking for. This is just a sampling of great pieces. _____________________________________________________________________________ BLACK AND GOLD WOOD BANGLE BRACELET - measures 1" wide. $12.95. _____________________________________________________________________________ VINTAGE BLACK STONE AND BRASS NECKLACE - measures 19". $26.95. Matching Post Earrings - $9.95. _____________________________________________________________________________ VINTAGE BRASS AND BLACK CHARM DANGLE BRACELET - $43.00. _____________________________________________________________________________ ALSO SHOWN, BRASS GEOMETRIC STRETCH BRACELET - 1 3/4" wide. $29.95. ASSORTED JEWELRY - We have a nice assortment of vintage and updated jewelry. Give us a call today and we can send you a picture of other things you might like! _____________________________________________________________________________ VINTAGE COPPER COLOR CHAIN W/BLUSH PINK FLOWER NECKLACE - Measures 30", with matching post blush pink Earrings 3/8" diameter. SET PRICE $38.95. _____________________________________________________________________________ VINTAGE MULTI STRAND BRACELET in gold, aqua, blush pink, freshwater pearls and garnet beads. $52.95. GOLD VINTAGE 19" NECKLACE WITH CLEAR RHINESTONES. Matching 1" earrings and bracelet. SET $21.95. _____________________________________________________________________________ GOLD BANGLE BRACELETS - set of 20, $29.95. HANDMADE STERLING SILVER MESH ROPE EARRINGS - 1 1/2" Hoop Earrings $54.00. 2 1/2" Hoop Earrings $61.00. _____________________________________________________________________________ HANDMADE STERLING SILVER MESH ROPE BRACELET - Five strand. $91.00. 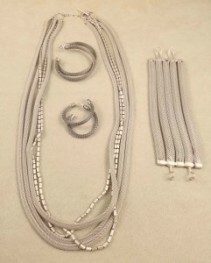 _____________________________________________________________________________ HANDMADE STERLING SILVER MESH ROPE AND LINK NECKLACE - 31" long, multi strand. $170.00.